Vegans, rejoice: The Spread Eagle has landed, London’s first vegan pub. The boozer on Homerton High Street officially opens its doors this week (Friday January 12) and vows to be the first fully-fledged vegan pub in London. That means it’s vegan from head to toe: food on the menu is 100 percent vegan, beers being poured and cocktails being shaken don’t use any animal by-products – even the leather is vegan-friendly. 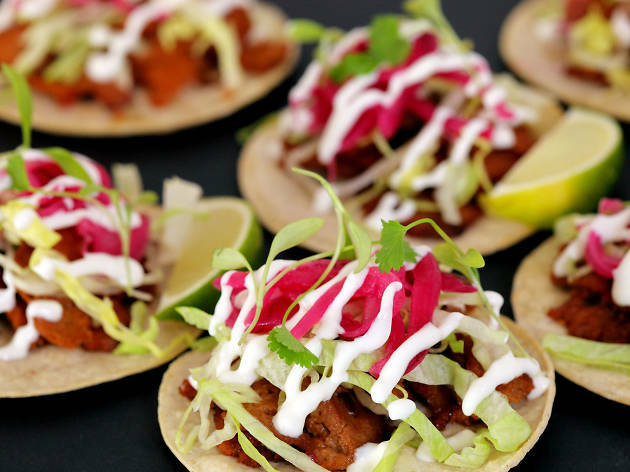 The pub is being brought to you by Meriel Armitage, founder of popular pop-up vegan-Mexican restaurant and street food operation Club Mexicana. 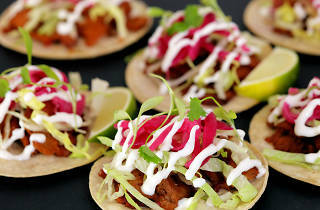 As such, expect Mexican-tinged vegan grub on the pub’s menu including jackfruit tacos and ‘tofish’ burritos. Vegan beers will be pouring from a total of 16 taps (many beers served down your average local still use animal by-products in the brewing process), while sour cocktails will use aquafaba (chickpea water) instead of egg white to achieve that famous frothy texture. But even if you’re not vegan, The Spread Eagle should be a hit. It’s decked in gold and midnight blue inside, while there’s a beer garden ready and waiting for the summer months. And despite being connected to Club Mexicana, the pub’s founders are adamant that it won’t be another gastropub – they’re planning DJ and quiz nights and a whole host more come weekends. It is east London, after all. The Spread Eagle is at 224 Homerton High St, E9 6AS, opening on Friday January 19. Find more Veganuary fun in our guide to London’s best vegan restaurants. Get more pub gossip delivered straight to your inbox when you sign up to Time Out. Mmm…fancy Mex/Vegan tonight…Siri look up ‘Mariachi Maracas?’ Nada? Ok try ‘Spread Eagle’ that should do it!